Why is a Bureau of Labor Statistics Contractor Not Bargaining in Good Faith? IAM members at Office Remedies, Inc. in Atlanta, a contractor for the Bureau of Labor Statistics, hold a rally outside the Sam Nunn Federal Building. The company has refused to bargain in good faith. The important information we have on the economy—data on unemployment, wages, unions and more—doesn’t just appear out of thin air. Men and women at the Bureau of Labor Statistics are taking surveys, asking the questions that need to be asked so we always have a snapshot view of our economic health. 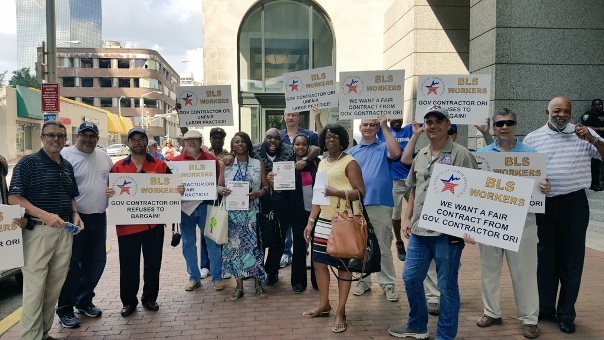 In Atlanta, 81 such data collection workers for a BLS contractor, Office Remedies Inc., overwhelmingly voted to organize with the IAM in October 2015. IAM Local 709 member Nina Garner made the trip from Marietta to join the action. “I came out today to lend my support to try to get this contract rectified, to get the people what they deserve,” said Garner. They overcame a nasty anti-union drive to join the IAM, and now the BLS contractor is refusing to bargain in good faith. Instead of meeting during work hours, a nearly universal practice, ORI is demanding to only meet at night or on weekends, when many bargaining committee members have family obligations. The IAM would pay for the employee’s lost time. “They offer a tiny raise, but then demand the workers give up vacation time to pay for it,” said Billy Barnwell, District 131 Directing Business Representative. 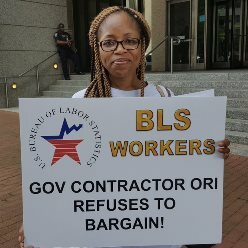 ORI has even hired a notorious anti-union law firm, Jackson Lewis, to stonewall its employees at the bargaining table. When ORI workers, who were joined by members of IAM Local 709 in Marietta and the Georgia AFL-CIO, recently decided to take their grievances public with an action outside Atlanta’s Sam Nunn Federal Building, the company called Homeland Security to shut it down. DHS officers refused to stop the protest. “We just want to remain middle class employees,” said Gaskins. IAM Southern Territory General Vice President Mark Blondin says ORI workers have the full support of the Machinists Union. The IAM has filed unfair labor practice charges with the National Labor Relations Board. To lend your support and stay up-to-date with the fight, like the Go IAM ORI Atlanta Facebook page.